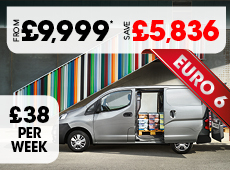 Hire Purchase allows you to buy the cheap new van you want yet spread the cost to fit your budget. Simply choose your van, decide how much you want to pay as a deposit (minimum deposit equal to VAT and the road fund licence) and then usew direct debit to pay the monthly instalments. You own the van at the end of the agreement. Cash flow – Hire Purchase allows you to pay monthly meaning that your use the rest of your money on other things. Fixed monthly repayments – the payment will be the same every month meaning that you can plan your finances. Deposit – with a minimum of only VAT and the road fund licence. VAT free monthly repayment – because you pay the VAT upfront, there's no VAT on your monthly payment. Tax advantages – if you are VAT registered, you can reclaim the deposit. Tax relief – you can claim 100% tax relief on all interest charges. Company asset – because your new van is an asset, you can be offset it against your taxable profits. Ownership – at the end of your agreement, you'll own the van. No mileage restrictions – you drive your van as much, or as little, as you want. Equity – you own the equity in your van. Any value above and beyond the settlement figure is yours. If you've finished the repayments, the value is yours. You can use this as a deposit against your next new van.